So you’ve created your amazing Media Library and the time has come to protect some or even all of your images. Well, with our request download feature you can do exactly that and much more. 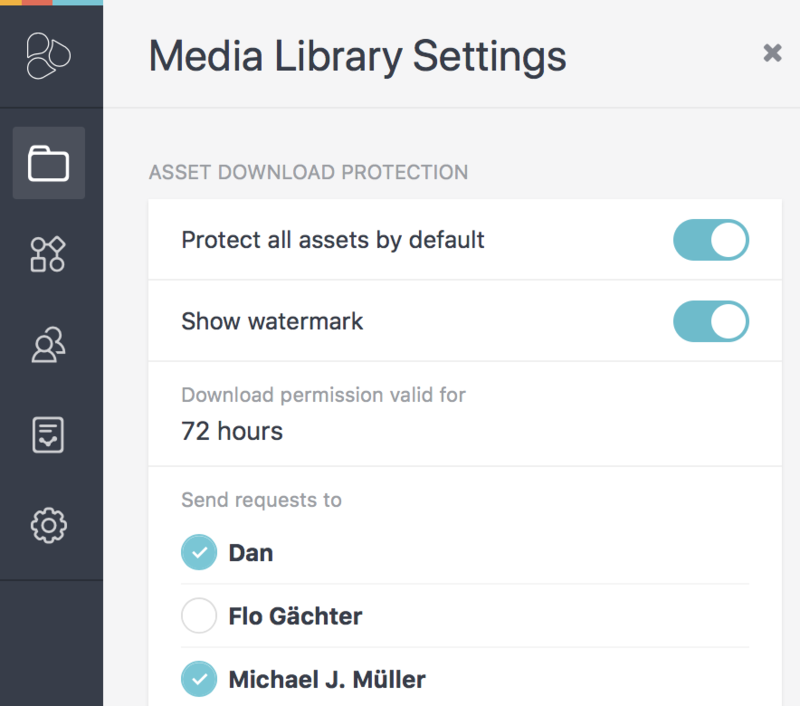 Maybe some of the assets in your media library are currently not ready for public viewing, naturally, you would like to know who is downloading these assets and what they would like to do with them. We’ve got you covered! If you don’t plan on protecting every image within the Media Library, then I would advise on setting up a folder for unprotected assets. This will make management a lot easier, especially if you have a large Media Library. Once you are in the media library, on the power bar, click on the ‘settings icon’ and then click 'Media Library Settings'. Here you can configure your desired setup. - Define who receives request. By default all the editors on Media Library project will receive notifications -> As an owner, you can deselect editors, if you do not want them to receive any requests. Now when someone would like to download a protected image, they will first have to make a request to download, which will be sent to the individuals you have chosen in the setup. The request can then either be accepted or declined. In both cases, a notification will be sent back to the person who made the request and if they have been granted permission they will be able to download the image immediately. New assets will automatically inherit either the the global setting, or the folder level setting. Settings set on an asset level will not be overruled by global or folder level permissions. - What asset, locations, until when they want permission to download the asset, when they requested it, and most important, what kind of reason they stated. Either approve or reject. If you reject, you can state a reason. - Notifications: notified about new requests, requestee will be informed either about the rejection reason or receive an email with the download link. In the screen recording below, I will show the setup and usage in more depth. Please contact our support team or your account manager at Frontify to activate this feature for you.